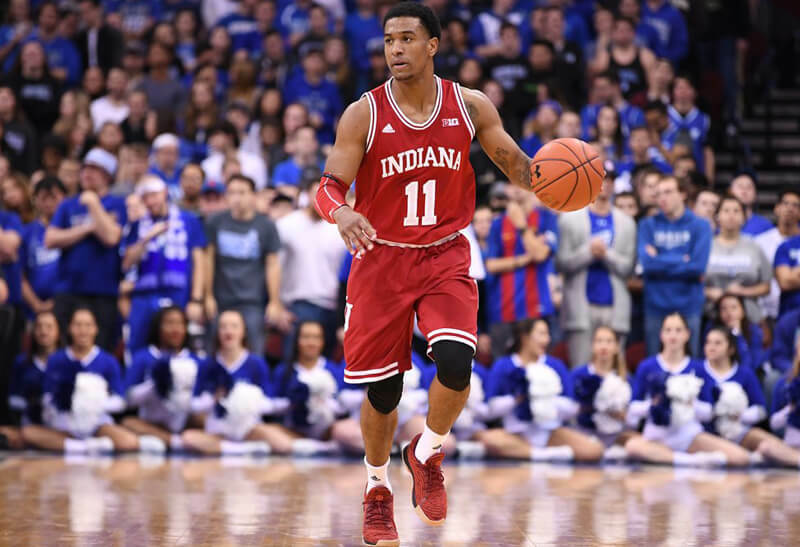 How it happened: Archie Miller warned on Tuesday that this would be a game “for the men.” And while Indiana showed flashes of improved play on Wednesday night in the Prudential Center, the Hoosiers were beaten handily by one of the Big East’s best teams. It looked like the Pirates would run away with the game early, but Indiana came back from an early nine-point deficit to claim the lead. Seton Hall led by just one at the half. The second half, however, was a different story. The Pirates were quickly into the bonus after the half and careless turnovers only put the Hoosiers at even more of a disadvantage. Indiana had no answer for two Pirates: Desi Rodriguez, who had a game-high 23 points, and Angel Delgado, who finished with 19 points and 11 rebounds. Through three games and two double-digit losses, it’s clear that Indiana has a long way to go in year one of the Archie Miller era. Standout performer: Devonte Green’s hot shooting kept Indiana in the game in the first half. The sophomore guard from New York finished with a team-high 16 points. Freshmen Justin Smith and Al Durham Jr. also had 10 points each. 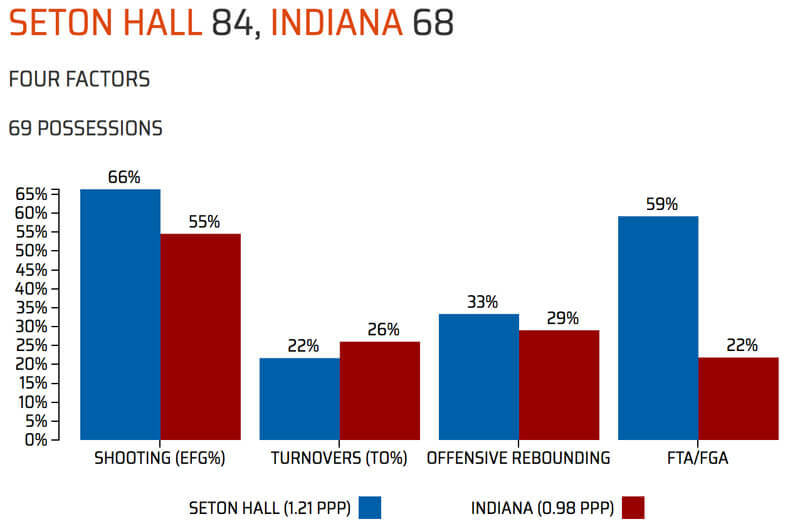 Statistics that stands out: Indiana committed 18 turnovers for a turnover percentage of 26. The Hoosiers were also outscored by 11 at the free throw line. What does “won anything” mean? National Championships=0, Final Fours=0, Elite Eights=1, Sweet Sixteens=1, NCAAs=6, all at a mid-major school. I would say that Archie has won. Ole Man… Here we are again. We get to watch yet another IU regime go through growing pains. I find it easier to follow IU when winning isn’t the main focus. Players coming together as a team is. Archie has been very patient with these kids. We all know that this is not going to be a great year. but it could close out as one. I am actually watching the Seton Hall game a second time now. I am looking at one thing. I can see an IU classic System coming back. Is that IU playing a half court set. Making three to 4 passes before they shoot? IU’s offense can only go one way. up up up! They are starting to drawl fouls. those numbers will go up. They are moving the ball really slow right now. but that pace will pick up. All these kids have put on 15lbs of meat. what do extreme weight lifters hate doing more than anything? Running. So as this season progresses these players will drop muscle mass, and that will free up their muscles. Their shooting percentage will what? “GO UP” that’s right ole man. in other news… all you Special Needs fans that wanted Alford, He is back in the news for not having control over his players. Thank you UCLA! ya can have all the Alfords and Balls ya want. I will take a Archie Miller having a laugh with Damon Bailey, Greg Graham, and Calbert Chaney any day. Get your check books ready folks. Ya might have to pay out some cash when Bobby Knight shows up for a game. it is not going to take long before the Alumni start speaking high value about Archie. Archie might be the first coach worthy enough to recruit Knight back. Lastly! Archie, keep that Number 22 open. There is a Bailey 2.0 coming to collect. (Yess I am Guessing. I do not need an understudy at IU school of law drilling me for facts) Bailey does play 1 guard the way Archie likes it. Really like the fact the you pick up on IU is building foundational pieces. Love the bit about “Special Needs” fans. LOL! I think you are seeing what a lot of true basketball fans are seeing. It won’t be long before IU basketball is truly back! hiding? Not so much hiding, I just haven’t been speaking. I was there with ya in the years Indiana was rebuilding with Crean. We really had fun on ITH in those ‘Dead Dog Years’. We watched the Hoosiers come alive. One player at a time. I liked Crean. I will never forget what he meant to IU. But Archie! Wow, what is not to like? He has everything we need to be great again. Did ya see where Archie sat down with Damon Bailey at a practice? (Chaney and Graham were there too.) Next thing ya know. Damon Bailey is at Hoosier Hysteria with Brayton. Guess who drug who out??? Brayton was supporting Crean. I can prove it! But Archie’s system is a better match for Brayton. When do ya think Archie will extend an offer to young Bailey? The kid plays just like Damon did. Go time to the basket. if you cut him off, he will find the man ya just left open. The Dude can thread a needle in a haystack. Archie needs to do a recruiting job like Knight did to Dakich. Tap him on the soulder and ask, “You going to come play for me at Indiana? I am hoping Brayton will race him back to Assembly Hall. What is your favorite part about Archie Miller Ole Man? This dude was born to succeed Bob Knight IMHO. Yet Miller still can invent the wheel at IU! Are you picking on Freddie? Have you ever seen Blab play? haha! Freddie is going to be ok! A lot of his drops are balls passed back to him he wasn’t ready for. Freddie needs to find an Aussie on campus. have the Skippy kick short 10 yard punt passes to him. if Freddie can catch those, he will find a basketball easy to catch afterwards. Above the waste thumbs together, below the waste, pinkies together. Fundamentals of catching any ball really.